This is dedicated to a young Christian friend that said she did not want to wear a mask anymore. She did not want to hide the sins that she was living in. She expressed a disdain toward others that haughtily wear their mask hiding their own sins… So this is to you and those like you, to show you the hidden dangers of a Christian wearing a mask. Let’s look at the nature of a mask. It hides something behind it with an image on the outside portraying what the wearer wants to be. The mask typically hides a lifestyle or personality opposite to what it seems. A real-life mask wearer will often play a part only in front of a certain group of people and take it off revealing in the secret confines of their life who they really are or want to be with a select group of people. Mask wearing is a false and often deceiving occupation. The intentions of a mask wearer vary: some to cover up the past, some to deceive, others to please people. It is false to believe that taking off a mask and revealing a sinful lifestyle is okay with God. One might say, “Living in an open sin is more truthful, therefore, more liberating than pretending to be something I’m not.” While you may not be lying, open sin is open rebellion. To think that God will bless an open display of sin under the pretense of “I’m not hiding it anymore,” is foolish. The reason Christ came was because of sin, he died for transgressors (open sinners) and those filled with iniquity (inner sinners). The covering we should be covered with first is the blood of Christ which has the ability to make us white as snow when we truly believe on Him and turn from our sin. In my life after being called to ministry at 12 years old I found out as the years progressed that it was not popular in my high school to say that I was going to be a missionary… I began to reject the goody-goody label. Eventually after many yo-yo decisions of being convicted about wrong lifestyle choices making a U-turn back to God, I began down a slippery slope. My excuses became, “it’s too hard to go against the flow,” and “I am just not strong enough.” My goody-goody mask came on at church and certain friends covering my fleshly desires and sins. My “this is who I really am” mask covered my Christianity among my worldly peers. In both cases I was wearing a mask… just like everyone else that claims the name of Christ and acts worldly. Looking back my failure was the result of a lot of factors, but centered around my inability to withstand temptation. I was not strong enough because I thought I could live the Christian life in my strength. The Bible says that Christ’s strength is made perfect in weakness (II Corinthians 12:9) and that He is the strengthener (Philippians 4:13). God used some humbling factors to reveal the true nature of my heart and both masks crumbled. I masqueraded as godless, hiding the light of God, quenching the Holy Spirit, and causing others to question my profession of faith! People told me, “I never thought I would see you in a place like this…” I doubt if I were to go to some of those people now that they would listen. Their last memories of me are of me doing wrong things. I believe my influence has been lost with them. 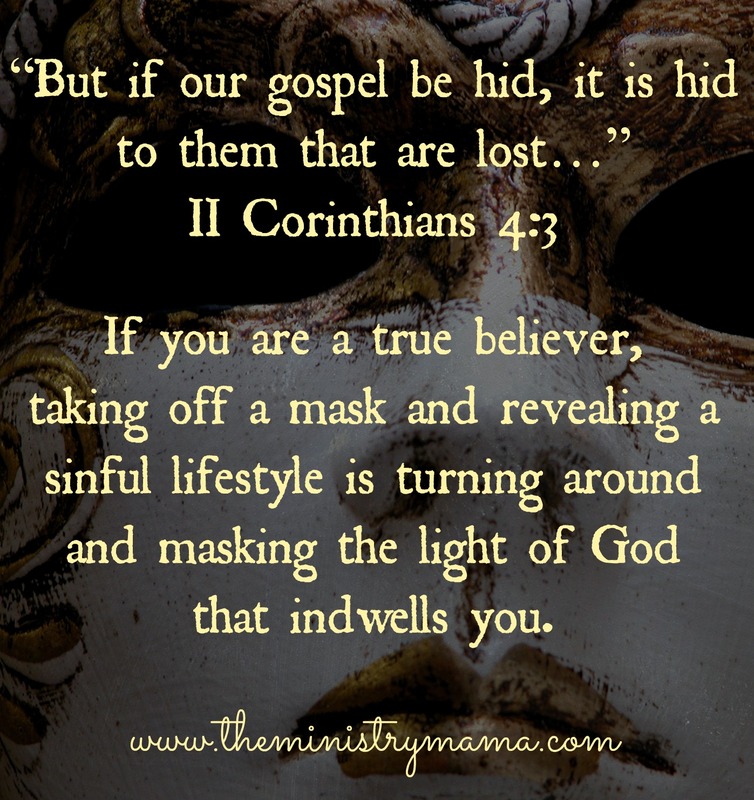 The Bible says in II Corinthians 4:3, “But if our gospel be hid, it is hid to them that are lost…” Taking off a mask and revealing a sinful lifestyle is turning around and masking the light of God that dwells in the heart of every true believer. It is the essence of the children’s song, “This Little Light of Mine.” You cover the light and allow Satan to blow out your influence to those that need it most, the lost who do not know Christ. How many people did I hinder from coming to Christ in the time I charaded and played the role of a “normal” person? How much time and money was misused in ungodly endeavors? How many that knew me then look at my changed lifestyle toward Christ now and discount it because of memories of me doing wrong? But we can’t do anything about them, we can only do something about ourselves. We, as Christians, should be transparent and honest in all things. Life is not a play, it is a real recorded-by-God action. Even our idle words are counted (Matthew 12:36). God has a remedy for believers, it is called, “Put off, Put On.” When we choose to “put off” all masks, we are instructed to “put on” the armour of God (Ephesians 6:11). A quick reading of Ephesians 6 will show that the armour of God has no facial covering. The armour provides spiritual protection. We already established that if you are revealing a sinful lifestyle then you are wearing a Christianity-covering mask. If a Christian becomes preoccupied with wearing a mask and is busy holding the mask to his face, then he has forsaken the shield of faith. Thus, when the shield of faith is forsaken, it makes him more vulnerable to the fiery darts of the devil and leaves himself more prone to spiritual attack physically, emotionally, and spiritually. The second item that is forsaken when a person is preoccupied with covering himself with a mask is the sword of the Spirit. The mask is like a covering to the light of the Holy Spirit, eventually if left deprived from the life-giving oxygen, it is extinguished. The Holy Spirit of God can only bear so much quenching (pouring water on and telling Him no). His purpose is to point to Christ. His job is to convict, convince, and comfort. When a person has immersed themselves into sinfulness and rejects the Holy Spirit’s purpose (Christ) and does not allow Him to do His jobs in their heart, then there is no choice but for Him to go away. This will leave the person comfortless in some of their most needful times of hurt. The loins girt with truth become vulnerable to being led astray by lies and false Bible teaching. The breastplate of righteousness is tarnished. Sinful living tarnishes the heart and life of the believer hurting themselves and grieving others. When the feet that are supposed to be prepared to shed abroad the gospel of peace have run to wicked places, it leaves no readiness of mind for the gospel to be given to the lost. Preoccupation with the world embraces the opposite of peace: strife, contention, pride, etc. The helmet of salvation is blocked by the mask. Godly fellowship is broken and influence decreases the more one is exposed to and participates in sin. To put on a mask to cover Christianity is to lose many battles of a spiritual nature because, “For we wrestle not against flesh and blood, but against principalities, against powers, against the rulers of the darkness of this world, against spiritual wickedness in high places.” Ephesians 6:12. Wearing a mask, revealing a sinful lifestyle, covering the light of the Holy Spirit is not a minor matter. It is to flirt with spiritual disaster both for yourself and the eternity of others. If we picture ourselves kneeling before God on the day of the Judgement Seat of Christ with our current lifestyle in hand. Would you regret it?Are you wearing a mask and covering the light of God within you? Are you causing others to stumble because you’re in open rebellion? Or is your breastplate of righteousness shining God’s light to the lost? Hypocrisy and sinful living should be dispensed of! Please read: Conquering Bad Thoughts if you are interested in changing. Conquering Bad Thoughts talks a bit more about the armour of God and its importance in helping us replace wrong thoughts and sinful lifestyles.